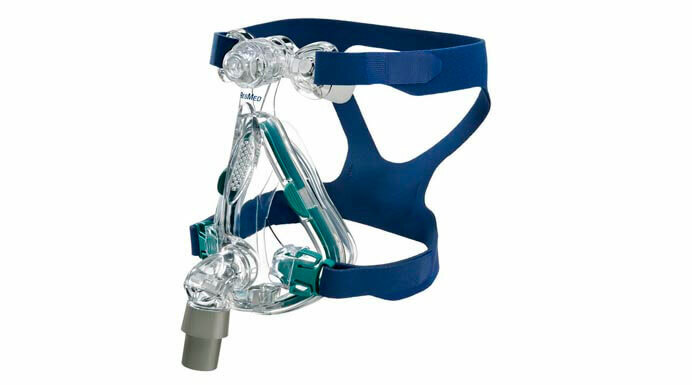 The Mirage Quattro™ is a full face mask manufactured my ResMed, one of the leading producers of devices for treating obstructive sleep apnea or OSA. 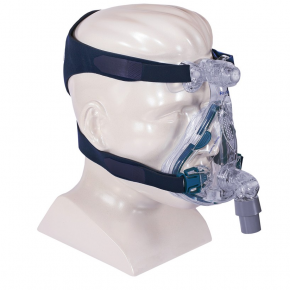 Its inventive design has taken the CPAP equipment market by the storm. Priced sensibly at $176, the Mirage Quattro™ features an advanced, adjustable seal for an enhanced fit. In addition, the new design also boasts a MicroFit Dial with 24 incremental settings that allow the wearer to choose the way the mask rests on their forehead. The Mirage Quattro™ is aimed at the customers with a moderate budget. Like we said, it is a full face mask with a headgear, which is ideal for those who sleep with their mouth open. It covers the mouth and nose very well and you can use it to protect yourself from allergens during the allergy season. The mask features a dual wall cushion along its edges. The designers have taken into account the fact that we often make jaw movements in our sleep. A good mask should be able to accommodate those movements. That’s exactly what the dual wall cushion does. It confirms to the contours of the wearer’s face and seals the chin perfectly and accommodates the movements of the jaw as well. 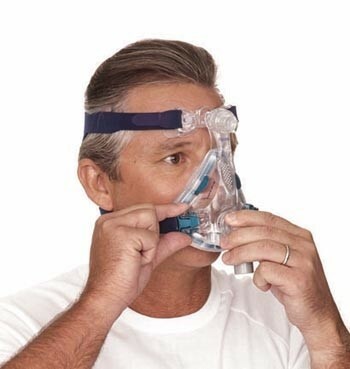 Pros: The Mirage Quattro™ Full Face CPAP Mask has been easier to use than expected for most first-time users. Several customers have reported that the MicroFit Dial and dual wall cushion made it possible for them to find their perfect fit. The headgear is attached to the mask with clips, which facilitate the user to take the mask off without taking detaching the headgear from the mask. This avoids the trouble of making a lot of adjustments again and again before every use. The Mirage Quattro™ Full Face CPAP Mask is available in four sizes; large, medium, small and extra small. The mask’s frame, elbow, forehead support, dial and valve clip are crafted using high-quality polycarbonate. The headgear clip and cushion clip are made from polyester. The silicone elastomer port caps, forehead support pads, cushion wall and valve ensure a snug grip. 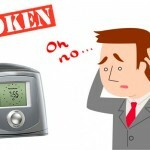 Cons: Like any other CPAP mask, the Mirage Quattro™ Full Face CPAP Mask has its own downsides. Users who have been using autotitratable CPAP machines often experience discomfort using the Mirage Quattro™ Full Face mask. The autotitratable machine adjusts and alters the pressure throughout the sleep according to the varying degrees of constriction of the windpipe. The Mirage Quattro™ Full Face CPAP Mask cannot handle the alterations in the air pressure. The mask is slightly heavier than the other full face masks available in the market. However, the Mirage Quattro™ Full Face CPAP Mask works well with straight CPAP machines that produce uniform air pressure throughout the use. Verdict: The ResMed products are known for their top-notch quality and functionality and the Mirage Quattro™ Full Face CPAP Mask is no exception. It does have a couple of downsides but they are definitely not the deal breaker. I did read good things on this mask but I am glad I found this review. I feel like it may not be what I was looking for. I don’t like anything heavy or pressure on my head. I am prone to headaches so that may be an issue. I will keep looking at other option. Someone I work with did recommend this and LOVES it but I want to see what else I can get for around the same cost.